The Great Lakes Science Center is a completely hands-on experience. You push handles, pull ropes and cables, and touch everything. If school was this much fun, we'd be a nation of scientists. Along with the permanent exhibits, there's always a large children's discovery area. It's easy to spend the day here getting lost in exploration, but save an hour for the Omnimax Theater. We're talking a cinematic experience unlike any other. You lean back in your plush seat inside a giant dome while a 70mm Imax film is projected into a four-story bowl-shaped screen around you, drawing you into the middle of it all. It can actually be a little overpowering, especially for young children, so viewing fare tends to be science-oriented documentary spectacles. Cleveland's Great Lakes Science Center dedicated a 156-panel solar array on July 11, 2007. The 300-foot cantilevered portico produces about 36 kW. The project was installed in a manner of weeks just prior to the 2007 American Solar Energy Society conference held nearby in the Cleveland Convention Center. The structure provides shade and a dramatic accent to the modern science museum on Cleveland's harbor front. The architectural solar array joins a 225 kW wind turbine installed a year earlier. The Great Lakes Science Center is open 9:30am to 5:30pm. It has 3 dining facilities, with varying hours. Wheelchair rental is available; strollers are not available. There's an information desk in the main lobby. At the desk, you can pick up some brochures for your visit, get demonstration schedules, and a handy museum map that you should keep handy, There is an attached parking garage as well; MAKE SURE to get your ticket validated at the info desk before leaving! Expect to stay a few hours to see everything. The museum is NOT a place just for kids. It's great for a the solo curious traveler, family, group, couple, etc. The Science Center is located between Brown’s Stadium and the Rock and Roll Hall of Fame. It is an great place to go with the family and provides educational information in a fun and innovative way. Films playing at the Omnimax are incredible and visually stunning and a great way to pass an afternoon or morning. If wanting a special souvenir the Science Center store offers books, puzzles, games and more to take home with you and actually use, not just put on a shelf! The Center has more than 400 interactive exhibits, daily demonstrations and an OMNIMAX theater at this indoor-outdoor educational center. The Great Lakes Science Center features over 250,000-square feet of exhibit space. The hands-on, learning displays include such topics as Science and Space, Technology, and the Environment with special emphasis on the Great Lakes. Science and technology displays include a bridge of fire, a touchable indoor tornado, and an especially good area that focuses on the environment of the Great Lakes region. 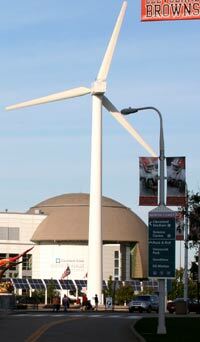 A working wind turbine on the front lawn provides the museum with supplemental, renewable power.